Horsemen agree that grooming is an important part of horse care, and proper grooming is essential for horses that are used in competition. Most recommend grooming a horse daily, although this is not always possible. 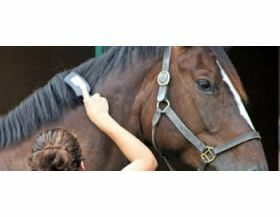 However, regular grooming helps to ensure the horse is healthy and comfortable. At a minimum, horses are generally groomed before being worked, and are usually groomed and cleaned up after a workout as well. Grooming There are no products in this category. Get your horse looking spick and span for the shows with all the different products available. Keep your horse shaved and looking smart with our range of clipping accessories. Whether its hoof oil for everyday or to make your horses hooves sparkle at the show, we sell a great range of oils, picks and brushes.